Psychopomps is comprised of smart, sad, poetic essays on a precarious, on DiFrancesco's extended growing up as a queer trans writer and activist. The essays are connected, but not linear (nor non-linear, exactly), all in the same universe, and have a gentle shape, as in you know when the book is coming to an end, but the collection doesn't feel aggressively sculpted. Nearly halfway through the collection, the meaning of psychopomps is revealed, if like me you didn't know but figured you kind of knew enough and couldn't be bothered to look it up anyway. I don't know who this book is for--other queer trans writer activists, DiFrancesco themself, anyone needing guidance? Nor do I know who the psychopomps of the title are--DiFrancesco themself, or the people in their essay. Or maybe they're what DiFrancesco is looking for. Perhaps, I think, it is because Poe was my first love, literature in general my second, and despair in literature my third. I never loved Poe enough to really get that, but the idea of literary despair as a love is appealing. DiFrancesco is mentally ill and despairs, "What if I disappeared from my life?" and empathizes with Nayla Kidd, a Columbia engineering student who disappeared (and was found) in 2016. DiFrancesco themself had "disappeared," but it wasn't a national news story. The people looking for DiFrancesco were friends, not family, and the NYPD was not...helpful. Like a lot of folks in alternative subcultures, DiFrancesco has nomadic lifestyle, but much of their story takes place in, or deliberately away from NYC queer-trans-poly scenes. They were married for a time to a trans woman and observe that sometimes alternative lifestyles are problematic in unexpected ways. As a white, middle class, able-bodied person, I think it best to quote this passage directly than try to interpret it. I had people around me that I considered family. They were anarchists and activists that I had met as an undergraduate student. We loved each other in all-consuming and often unhealthy ways. We wanted to make a new world. Often, we just ended up flipping old hierarchies. Those of us who society had abused often found we could spin this abuse to hold over the people closest to us--and sometimes we did. Power structures weren't subverted, they just got turned upside down. A lot of us are still recovering from the wreckage of this. I admire when someone is willing and able to critique things that are precious to them. I live the same city and in the periphery of some of the scenes DiFrancesco describes. Occasionally I know someone they mention and feel a jolt of recognition, for example about someone who I found to lie needlessly. Why? A serious reviewer might not comment on the essay A Better World in the way I am. BUT the chapter is about a library. With a library cat. Who is a giant orange tabby. That is 100% my better world, too. Despite a solid history with libraries, it takes DiFrancesco to find their way to the library in the small town they're living in during a break from New York. Their relationship with the library is sweet--at first--until it isn't. There are reasons trans folks live in big cities. There are also insights into trans communities that I found moving, like the practice of trading clothes. There are many in-person and online clothing exchanges for transgender folks. In fact, it's one of the leading ways, in early transition, that we shed who we were and become someone new. It seems particularly resonant that we often do it as a community, with the people our friends once were a major part of the people we are becoming. That material family and self building is endearing. I think of the sweetness of similar exchanges in my own life, that though less fraught, always make me feel connected when I pull on an old friend's shirt or see someone in a sweater that used to be mine. Catholicism is allegedly a monotheistic religion where it is okay to revere the knucklebone, or some other artifact, of someone blessed by God. But also making a serious examination of the saint DiFrancesco, Alex, chose at their communion to name themself after (middle name, at the time): Saint Alexis. Saint Alexis cast aside his family wealth and wandered. Upon returning home, he was not recognized, and lived with beggars until he died. When his father identified his dead son, he lamented, "Why have you treated us so cruelly?" 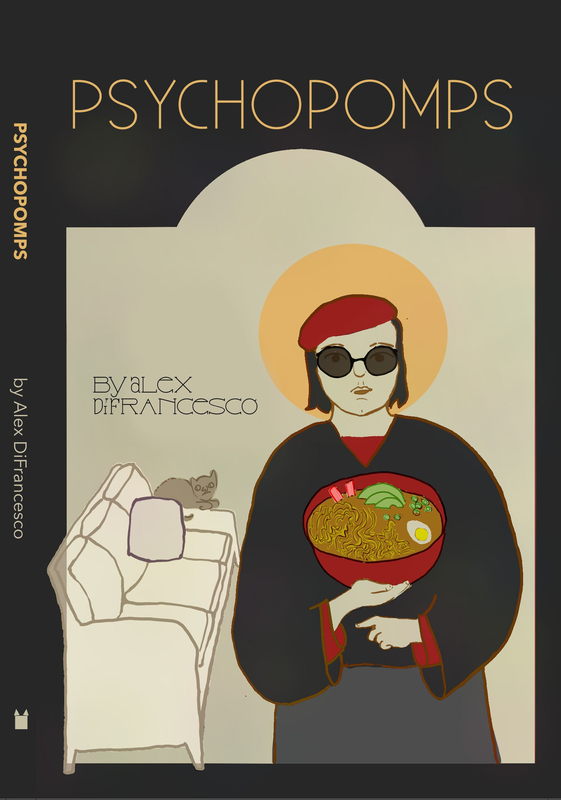 Young [dead name that normally is worn by a girl or woman] DiFrancesco chose a male saint and also left home, but perhaps not as willingly as Alexis did. Time will tell if they are also held accountable for the family's pain in the same confusing--monstrous? way. It is DiFrancesco's mother, however, in whom most of the fraught history is located. There is a bittersweet passage where DiFrancesco exposes their mother's unrealistic vision of them, but offers some sympathy to it. How can I dream of sacred visions and discount hers?